A balanced healthy diet is so important to our well being, but with all of the information coming at us from every direction, what that means can be confusing sometimes. I have assembled my top 10 healthy eating tips on two pages on the site. Five are on this page and you will find another five eating healthier tips on the site here. Incorporating these foods and tips into your life will help ensure you stay on the path of wellness. Legumes and pulses such as pinto beans, chick peas, green peas, kidney beans, black beans and lentils are nutritional powerhouses and should be an essential element of your healthy eating plan. They are low fat/high fiber foods, making them fantastic healthy food choices. Fiber is extremely important for optimal functioning of our entire system. Both soluble and insoluble fiber is necessary for a healthy body and pulses contain them both. Soluble fiber is the one that helps to decrease LDL cholesterol levels ("lousy" cholesterol), while insoluble fiber aids in digestion and helps to regulate our bowels. You can incorporate these wonderful foods into your life quite easily. Chili with mixed beans, lentil soup, hummus, chick pea salad and bean burritos are all ways to eat more legumes and pulses. Making homemade soup is a fantastic way to ensure you have a balanced healthy diet. Easy soup recipes that incorporate an abundance of healthy vegetables, legumes and pulses are not only healthy food choices, but make very easy dinner recipes too. I love to make a large pot of vegetable bean soup or vegetable and meat soup at least once a week. That way a delicious and healthy meal is just a few minutes away. A while ago I read that a study had shown that people who eat soup every day had a much easier time losing weight than those who don't. I think the reasoning was that the broth, rich in nutrients from the vegetables cooked in it, fills you up without adding a lot of calories. (Of course heavier cream based soups won't provide quite the same results). Soups are usually fantastic budget stretchers too. Even if you do add meat, which I do on occasion, the meat is usually used as a flavoring agent and not the basis of your meal. We talk a lot about the health benefits of fruit, vegetables and healthy grains, but let's not forget that a balanced healthy diet benefits from the nutritional properties of herbs and spices too. Cinnamon, for example, helps to regulate blood sugar. Cinnamon is common in dessert recipes, but you will also find it used in savory Moroccan recipes and the cuisines of other countries. Turmeric, a staple of Indian curries, has been shown to have a wealth of health giving properties. It has significant anti-inflammatory properties, which have been shown in studies to be as effective as some over-the-counter and prescription drugs. Common parsley, which we often ignore as a decoration on our plates, contains flavonoids that act as antioxidents in our bodies. It is also an excellent source of Vitamins A and C.
Adding fresh herbs and spices to your meals not only adds fantastic taste. It helps ensure a balanced healthy diet as well. You have probably heard that nuts can be high in calories. There is some truth in that. BUT, although we may not want to eat them a pound at a time, nuts do deserve a regular spot in your healthy eating plan (ideally daily). The health benefits of nuts like walnuts and almonds have been proven over and over to be exceptional. Walnuts are an excellent source of omega-3 fatty acids, which is an essential acid that our bodies do not produce. Walnuts also contain many powerful antioxidants, plus Vitamin E, copper and manganese. Both walnuts and almonds are high in mono unsaturated fats, the healthy fat found in pure olive oil. Almonds are also an excellent source of vitamin E, magnesium and potassium. Raw unsalted nuts are a great addition to your balanced healthy diet. Add them to salads, on top of your cereal or yogurt (my favorite), to your muffin batters, stir fries or stews, or munch them as a snack. They are both satisfying and healthy. The best and easiest way to ensure you are eating healthier is to "eat a rainbow". Color groups of vegetables and fruits tend to have similar nutrients and health benefits. If you make sure you eat from all color groups you will be going a long way toward ensuring you are eating a balanced healthy diet. So if you are like many of us and eat the same fruits and vegetables over and over, shake it up a bit. Try stir fries or vegetable stews, like ratatouille, that incorporate a wide variety of vegetables in all the colors of the rainbow. Not an adventurous eater? Just try one new thing, or new ways of cooking what you already eat. Trying one new thing and finding that you really like it, often encourages us to venture into more new territory and try other things. So let your plate look like a rainbow, filled with yellow, green, red, brown and blue, and you will be sure to be on the road to a balanced healthy diet. 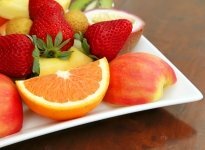 You will find 5 more tips for a balanced healthy diet here.